See also our other pages about Iceland. Click here. 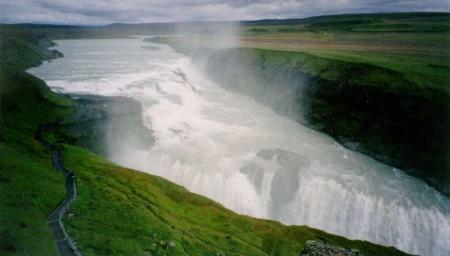 wonders of the world.Gullfoss is also by far Europes most powerful waterfall. It is in the mighty glacial river Hvita (White river), just a few kilometres from another natural wonder, the world-famous Geysir. The enormous white glacial cascade drops 32 metres into a narrow canyon which is 70 metres deep and 2.5 kilometres long. In winter it has an unusual appearance when it is garbed in ice and snow. a threat to travellers, rich and poor alike. claimed that mysterious monsters dwelt in these streams. Today the waters still flow from the mountains to the sea, a continuing source of wonder and mystery. 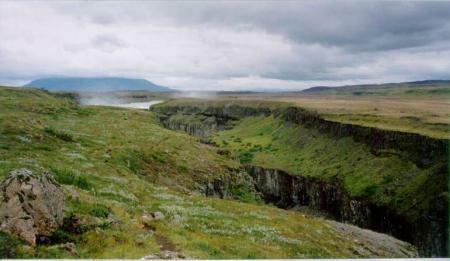 The watershed of the Ölfusá river region covers some 6100 square kilometres, or about one seventeenth of the entire area of Iceland. With each passing second they empty some 440 cubic metres of fresh water into the ocean, amounting to a total daily flow of 38 million tons. occurring near the end of the last ice age. to fill the building nearby showing tourists the history around Gullfoss. on the river Hvítá have been proposed. Based upon values measured in kilowatt hours. 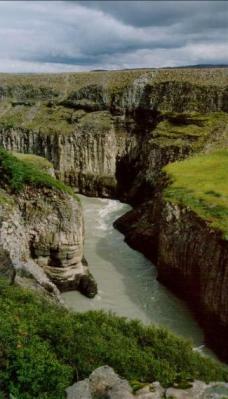 The land surrounding Gullfoss is about 200 metres above sea level. Vegetation is typical of Icelandic heathland and many of its characteristic forms are visible here. Lichens grow on the rocks, forming irregular patches of varying colours. Wooly willows are widespread in the dry moorland and are easily recognised by their light green leaves covered with grey fuzz. chests and drawers as it gave a fine scent to clothes and linens. 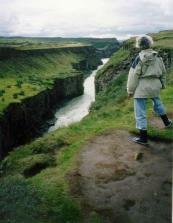 to Gullfoss, and laid the first pathway down to the falls. The attitudes of these people, many of whom had travelled great distances to catch sight of Gullfoss, must have had considerable effect on Sigríður. and drew and embroidered figures of flowers and animals. 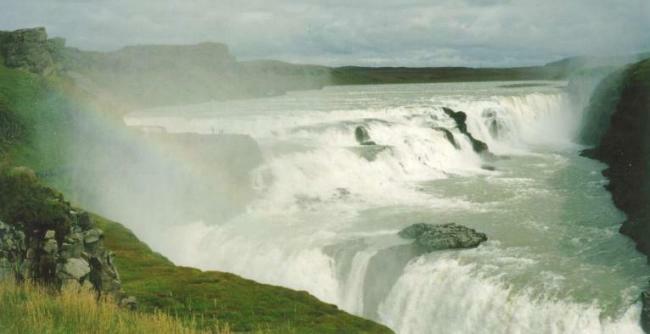 efforts regarding Gullfoss, and a monument to her was erected there in 1978.
equal to fifty times the assessed value of the farmhouse at . Brattholt. Tómas, the farmer of Brattholt and Sigríður's father, replied "I won't sell my friend." and fulfilling certain conditions. After the law was passed, surveillance was relaxed, but hydropower speculators managed to gain control of many of the country's largest fallsnonetheless. 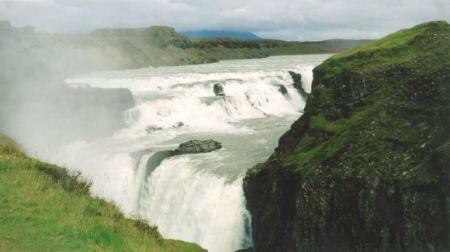 richest and most powerful men in Iceland and have the agreement concerning Gullfoss revoked. She put every ounce of effort she could muster into the struggle, made one long journey after another, crossing mountains and fording rivers, in all seasons. In Reykjavík she went from one official to another, but all in vain. The court handed down its verdict against her. In December of 1976 Einar turned over part of the Brattholt property to the Nature Conservation Council, stipulating only that the land was to be fenced before the end of 1977 and that it would be thenceforth used as provided for by the nature conservation act. Gullfoss on March 9, 1979.